Living in San Diego I have the luxury of grilling outdoors nearly all year around. With the exception of rainy and really cold days (read: wind chill below 55!) the grill is usually fired up 3 - 4 times a week. From the garlic bread to the veggies and meats, I love the ease of putting the whole meal on the grill. Saving time on cleanup is a bonus. Over the holidays, Amazon had The Sunset Grill Cookbook on one of their "Deal of the Day" specials and I tossed one in the cart for as a gift for my friend Becky (of Becky's Famous Football Stromboli!). Not wanting to give her something that I couldn't vouch for, I figured I'd better add one of those books for myself as well and I'm thrilled I did!! Last night was the first time I ventured into the book, and if the rest of the recipes are half as good as the Chicken Satay with Spicy Peanut Sauce, the book is a winner. 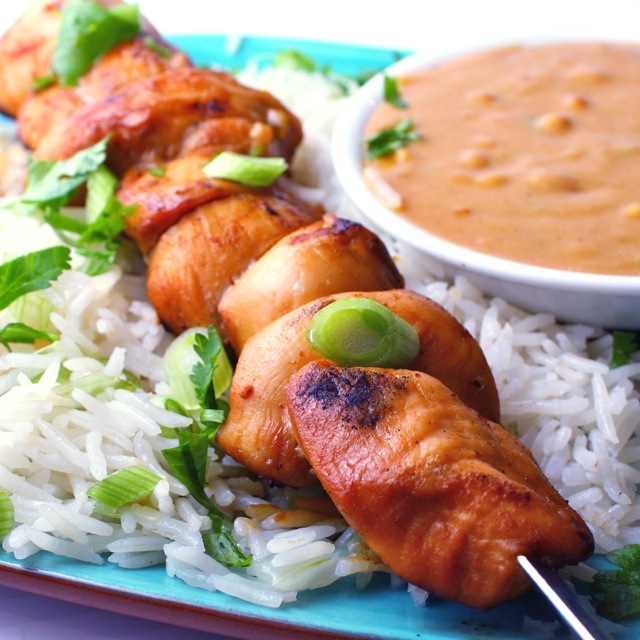 Simple marinated chicken is threaded onto skewers and served alongside a Spicy Peanut Sauce. Perfectly complementing the Asian flavors of the chicken skewers, the sauce quickly became my favorite part of the meal... part peanut butter, part coconut with a ginger essence and a bright squeeze of lime to finish it off. A bed of coconut rice rounded out our meal and everyone including the dishwasher (me!) was happy! In a small bowl combine the marinade ingredients (soy sauce through water) and whisk to combine. Add the chicken to a large zip top bag, add the marinade and seal. Squish the chicken around in the bag to coat and place in the fridge for at least 4 hours. Make the sauce. In a medium bowl combine all the sauce ingredients and whisk well to combine. If sauce is too thick, add a little extra coconut milk, if sauce is too thin, add a little peanut butter. Taste and adjust ingredients to your taste (I love lime, so I added extra lime!) Set aside. Thread the chicken onto skewers. If you are using wooden skewers, soak the skewers in water for 1/2 hour before threading. Preheat grill on high. Place skewers on the hot grill and reduce heat to medium. Cook for about 3 - 4 minutes, then flip to grill the other side. Grill a few minutes more (time depends on how large your chunks or strips are!). Remove from grill when chicken is cooked through. Serve over rice with the Peanut Sauce on the Side. Kim, This looks so fresh and wonderful. My grill is under two feet of snow here in Boston. We like to grill year round too. But, now its impossible! I LOVE chicken satay...one of my favorites! This recipe is so colorful and pretty...we can grill pretty much year-round here in Texas as well!! From March until about October...give or take. In Chicago we had a HIGH of 10 day and we tried to grill last night and it couldn't heat up enough to cook anything! Once we can grill again I'll definitely make some Satay! Looks so yummy! Our next project in the "new" home is to tide up balcony and garden to start grilling! When that will happen I will know whom to ask for amazing recipes but for sure this will be the first one 'cause chicken satay is one of your favorite grilled food we often order when we eat out! I hope you are having a great grilling weekend! I am sitting here watching the “Dim Sum” episode of Top Chef and wanting to cook an Asian dish!!!!! Thanks for the inspiration! We eat so much chicken, I should add this to my recipe collection. Even though our weather is not quite as warm as yours, we also grill year round, even in the rain. It's tough somethimes when it's 45 and raining, but we manage! I love this peanut sauce just like everything with peanuts.. :) I really have to try it..
Fabulous one of my favorite sauces! I almost grilled today but it was 15, I just couldn't get myself outside to do it! 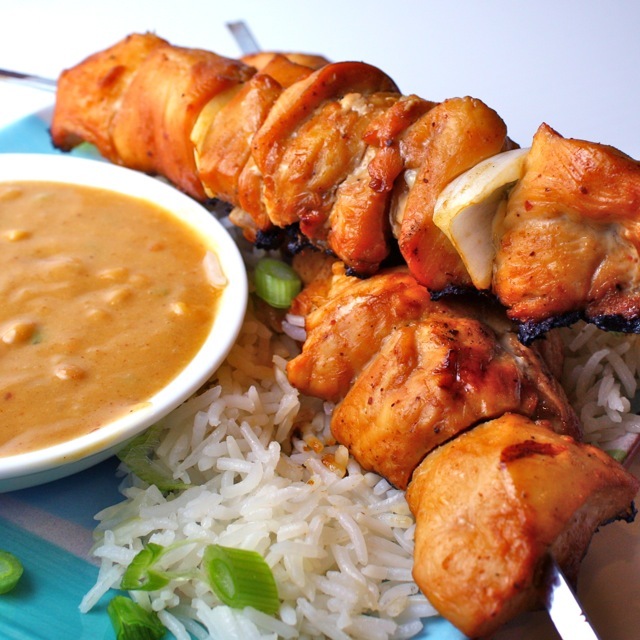 your chicken satay looks delicious and that spicy peanut sauce the perfect compliment to it! OOhh!!! You are all making me feel extraordinarily lucky with your weather reports! I will admit to being the ultimate whimp when it comes to weather... Hang in there all, spring is on its way!! I've been craving a good peanut sauce and yours sounds perfect! I cannot wait to get back to SoCal in another week where I can grill every day again, too! I've been away for quite awhile and I'm ready for the mid-70's and sunshine! Thanks for the great recipe! Lov satays. The last time I made them (http://coloredgrains.wordpress.com/2011/01/15/meeting-old-friends-and-home-made-satays/), i dint try the peanut sauce. Hey Kim, this looks wonderful, my hubby would go crazy for these chicken skewers with peanut sauce, I'll have to make this for him! Oh! I love this...looks sooooo yum!! There is a similar chicken satay dish on Top 9 today, could this be the next new trend? LOL, I love your version and I often make satay sauce with peanut butter too. It's so easy! That sounds so delicious. I am so jealous of your ability to grill throughout the year. You'd think I'd be able to, too, here in AZ, but from Oct until March, it's too cold, snowy and windy. I am looking forward to firing up the grill again and trying this out. That's how often you get to grill?! Oh my, I wish. Your peanut sauce - yum on the garlic and lime! mmmm, sounds delicious! This meal is right up my alley. My Mom and I love this kind of food. My husband is a crazy picky eater so I usually end up inviting my Mom up for a girls weekend to eat, cook and watch movies. This is definitely going on our next menu! Thank you!! I wish I could dip my finger in that sauce. Kim, I know I have said this before, but your photos make me want to eat my screen:) So yummy......this ones a keeper to try for sure. How lucky to be able to grill almost year round. My BBQ has not left the garage for the past 3 years as the weather has been so horrible. I will have to perfect indoor grilling, and this is a perfect dish to try. My mouth is watering just reading the satay sauce recipe. Your recipe looks so simple and delicious! I can't grill right now, but I could broil these skewers up or use a grill pan ... note to self: purchase a grill pan! Your photos are so wonderful on this post! Colors are so vivid and the lighting is awesome! This peanut sauce sounds so tasty! Can't wait to try it. Kim, this is very lovely :-) I've never made chicken satay or peanut sauce before. I don't have a grill :-( I have a grill pan, though. That would work, right? Hope your Santa Anas have finally arrived! It's actually a bit windy up here today :-( PS--the photo looks soooooo pretty! The color contrasts and the individual grains of rice? M-O-N-E-Y! Even with the snow outside, we always find a reason to fire up the grill! The weather is not a factor! Hehe... I have a feeling that this will be on our grill very soon! I am so envious of the ability to grill for most of the year. ;) This looks delicious. I must try the sauce out for sure. You have no idea how much I love peanut sauce. LOVE IT! And I like that yours has no added sugar, because that helps me! Seriously jealous that you can grill out right now, our grill is buried under several feet of snow at the moment! Your posts and photos outdo each other each time Kim, another recipe I must try! I do love every version of satay known to man/woman. (I also love San Diego - especially this time of year). This satay sounds scrumptious. Photos are lovely! My husband and I love grilling year round here in Arizona too :) We were just saying we needed a few more "outside the box" grilling recipes...and this is definitely one for us! Thanks for sharing...can't wait to give it a shot! Your recipe sounds so good and healthy with the chicken, peanut sauce, and all those spices. Great recipe! What a gorgeous looking chicken satay.I am so jealous of you. Where I am, I have to wait for winter to be over to get my grill out. But I did buy electric grill last year. I will let you know how it turns up in electric grill. I used to live in SD and miss the weather. Now I am in snowy NY, and we are only able to grill indoors! This looks fantastic! Sure Kim, rub it in. We got below freezing temps this AM! Thank goodness for sunshine though we should be ok and I may just grill this week! We are HUGE chicken satay lovers at our house and a spicy peanut sauce is enough to make me drool. This chicken satay looks awesome! Amazing! Made this tonight, the boys couldn't get enough and I had to hide the rest from myself. Will be making again!